Vegan Pumpkin Fettuccine! Yes, alfredo sauce can be healthy! Made with a secret ingredient, this sauce is creamy, slightly sweet with a hint of nutmeg and sage. You will never go back to regular alfredo sauce again! Show me someone who doesn’t love fettuccine alfredo and I will show you a liar. Or someone with amazing willpower. Cream. Butter. Cheese. The holy trinity of a delicious, artery-clogging meal. Unless you make a sauce that is just as creamy and rich, without all the unnecessary cholesterol and saturated fat. Sure, fettuccine every now and then isn’t a big deal. We are all allowed an over-indulgent meal every now and then. But why? When you can make the same sauce with a fraction of the typical calories and fat, I don’t see the need. Plus, this version allows fettuccine to be on the menu a lot more often. A win-win if you’re counting. Since all of my recipes this month have been getting a pumpkin makeover,-fettuccine alfredo is no exception. A simple addition of pumpkin, sage, and nutmeg makes this the perfect fall meal- and fancy enough to serve for others. 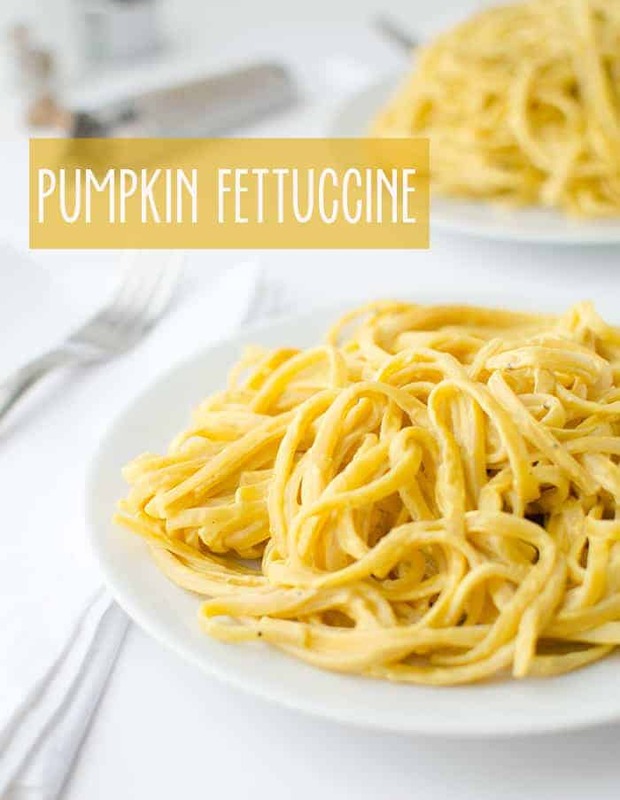 It is so good, this pumpkin fettuccine alfredo it has made the short list of my Thanksgiving menu. 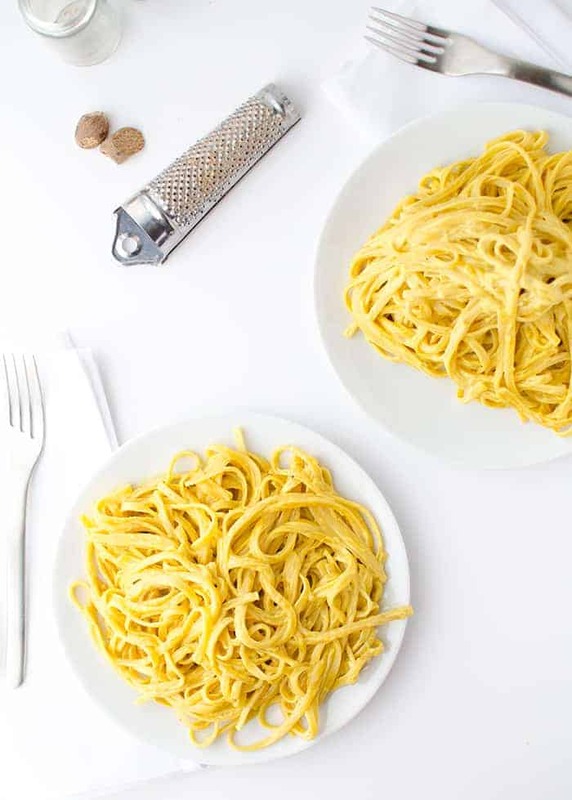 Vegan Pumpkin Fettuccini! Yes, alfredo sauce can be healthy! Made with a secret ingredient, this sauce is creamy, slightly sweet with a hint of nutmeg and sage. Bring a lot pot of salted water to a boil. Add the noodles and cook until al dente. Drain, reserving 1 cup of the cooking water. In a high powered blender or food processor, combine the cashews, lemon juice, non-dairy milk and blend until smooth, about 3 minutes. Add in the dried sage, fresh ground nutmeg and canned pumpkin. Blend for another minute, until combined. 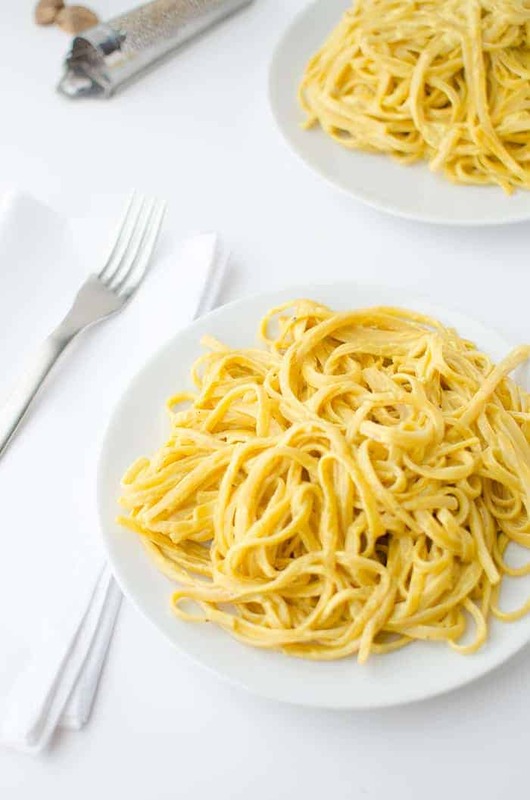 JUST before serving, add the pasta to the noodles. Thin with reserved pasta water if needed. Serve immediately. 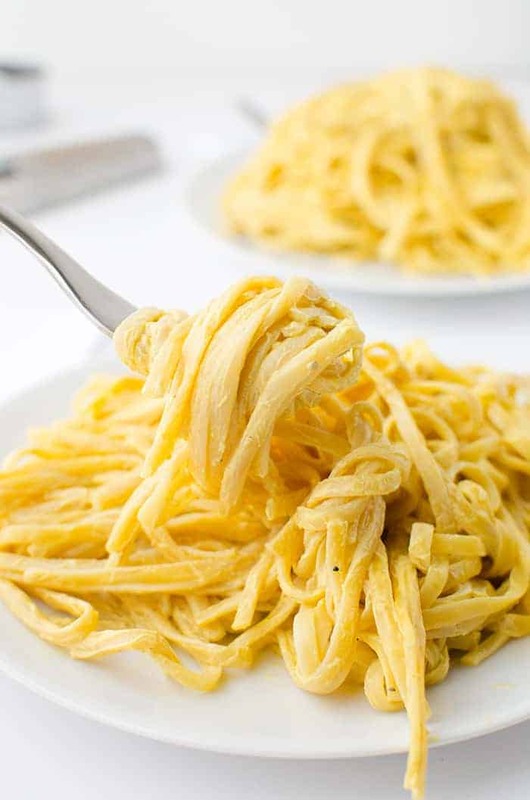 I don’t think I have ever seen fettuccine look this delicious before! Definitely loving the pumpkin flavouring.. you can definitely consider that I will be recreating the recipe. This looks totally delicious! I often add pumpkin to a cheese sauce to reduce the fat in a sneaky way, but I love that you’ve used cashews here for a creamy base. Who needs the holy trinity when you’ve got cashews and pumpkin?! Thanks for the recipe! Awesome Idea!! That looks amazing! Did you make your own pasta? It looks fresh? Thanks Aaron! I did not use fresh pasta for this one, I believe I used Barilla Fettuccine! This was fantastic!! I just added some salt and fresh ground black pepper to mine and a bit of garden peas. But it no NO way makes 25 servings!! More like 4 servings! I think you must have a typo??? Super creative! I swore it would’ve been a cauliflower sauce blend with pumpkin… but cashews, genius! Can’t wait to buy your book when it hits the shelves!! Yum!! Can’t really go wrong with fettuccini! Can you sub purchased, pre-made cashew milk for the fresh blended cashew milk? I do not have a blender or food processor up to the task. Thanks! Hi Jenny, yes- you can use premade cashew milk but it just won’t be as thick/creamy.